MapleStory is a free, Korean MMORPG game in the fantasy realm. The title is characterized by a way of showing the game, reminiscent of side-scrolled 2D platformers. The Universe is divided into five continents: Maple Island, Ossyria, Ereve Island, Victoria Island and Masteria. Maple Island is a training map after completing the tutorial there is no way to return to it. 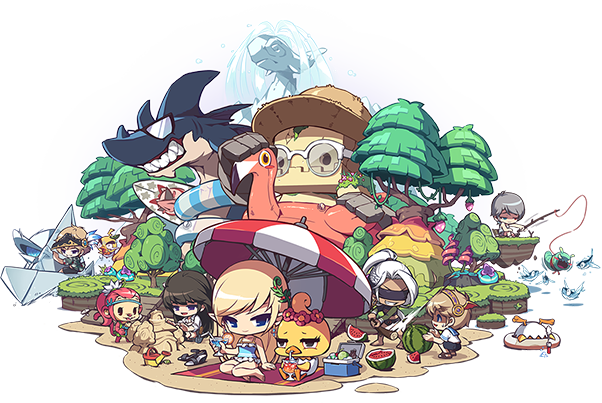 MapleStory also has special maps created for special occasions such as Christmas, Oktoberfest, Hanukkah, Halloween etc. The game focuses on the fight against monsters, for which the player is rewarded with experience points, allowing the hero to develop within the extended character class system. Each character has different skills that we can develop as the game progresses. For killing monsters, in addition to the aforementioned experience, we get a meso (currency in the game) and items. The array of creatures is really impressive: from gentle to aggressive, moving on land and flying, and those with special skills which pose a challenge for players. There are also particularly strong beasts, singly or in groups. It is more difficult to find because their spawn is defined in time or it is required to meet certain conditions, eg using a special object. They have much more HP in return to provide interesting items and a large amount of experience. There is no shortage of quests in the game, which we get from the NPCs. In most cases, these are traditional tasks consisting in whipping a specific mob, solo or with the support of a group. Often, there are also time-limited events related to the season of the year, a holiday or an important event.